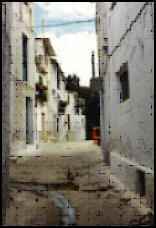 If you drew a line between Granada and Almeria in southeastern Spain, you would find the tiny medieval village of Picena almost directly between the two, in the Alpujarras mountains, part of the Sierra Nevadas. From our house you could see snow on the mountains behind us, or , below, the Mediterranean glinting in sunlight, occasionally even a large ship. It was the closest to paradise that I ever lived. Traditionally the local campesinos lived in fortress-like villages where it was safe and children could enter any house, be spanked or given candy by any adult. Each morning early the men went out, singing to their mules, to plough their terrenos, the small terraces of cultivated land built and irrigated by the Moors before the discovery of America. The Moors converted a desert into the fruit basket of Europe. Throughout the year you could tell the seasons – oranges and lemons was Christmas, figs came in the autumn, almond trees and fields thick with poppies bloomed in the spring, and cherries heralded the beginning of summer. Most significant were the olives. The whole family participated in the harvest, climbing the trees and hitting the branches, catching the olives in large “skirts,” taking the crop to market to trade for a year’s supply of the oil and a little cash. A good farmer could tell the tree’s output to the quart. 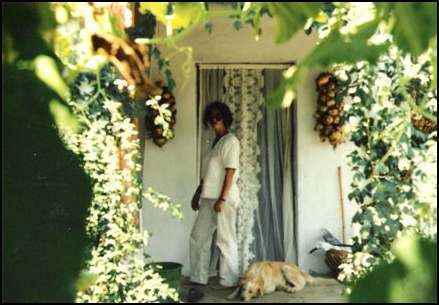 Art and I bought a three-story narrow rock and plaster house in Picena in 1987. It cost about $1,500 and was at the bottom of the village – not a choice location. We fell in well with the locals, despite Art being at least a foot taller than all the men and me being shy in a culture where garrulous women are the norm. We ate free tapas in the bar and looked for a terreno to buy, to practice self-sufficiency. We were pronounced to be muy buena gente – very good people, a singular honor for the town’s only foreigners. Then came the hippies, most of them Germans, young people with high ideals, or older beautiful people feeling from places like Ibiza and Malaga when the tourist incursion became overwhelming. With an unemployment check from Germany, you could live like a cacique (a rich landowner) in Spain. The young folks, without the scars of war in their memories, wanted to live on the land, bask in its natural beauty, and, it must be said, smoke cheap hashish readily available from Morocco. The German hippies lacked what I, who had worked as a volunteer in Africa and Latin America, called “cultural sensitivity.” They adored plant life and appreciated the bounty of foods to be had for the plucking, but they disdained the town system. They didn’t want to live like peasants – they wanted to live like the rare birds they were. Peasants stayed in town for security and used the fields for the purpose they believed God intended: to plant and harvest, to procure food and a little money. The sight pf people constructing fake chalets on the narrow terraces, bathing in full sight of the eyes of the world, and defecating in the grass, was a source of bemusement and not a little hostility. Only one man stood above the fray. 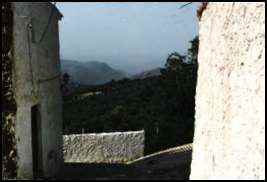 Bill, a Venezuelan-American who had lived many years in the Balearics, was the first foreigner to explore the poor side of the Alpujarras. He was there when we got there, and welcomed us. Bill had the advantage of excellent Spanish. He was quickly “adopted” by a local family who sold him several fertile terraces. The little cottage he built blended well in the surroundings, like a shepherd’s hut. He built a bathroom using a simple dug latrine, and it mostly worked. He used no drugs and was a modest quiet man, vegetarian and follower of Yogananda. He had few books and no need of study. His way with plants was magic. Flowers trailed over his porch and his vegetables spread across the ground in abundance. He tried local crops with local advice. Some days he ate only almonds or potatoes. His needs were simple. He had no pension or unemployment compensation. He was one man, alone in his Walden on a mountainside in paradise. The changes came little by little. You could count it in years – the year of the Germans, the year of the televisions, the year of the tractor, the year of the Argentineans – but it seemed faster and more immediate when you lived there. Suddenly there was television, the world outside pouring into the living rooms of the campesinos as never before. In the dark years of Franco all useful news had been suppressed. Now people saw jogging suits and flavored yogurt. They demanded more goods at the tiny local shops. To get the goods required the courageous spirit of the taxistas, men who negotiated the twisted mountain roads to make buying trips to Granada and Almeria. They came back with what one taxista characterized as cosas tontas para la casa – stupid stuff for the home. One day we heard, drowning out the canto hondo of the muleteers, a tractor. A prosperous shop owner had bought a tractor. Women still went to the many-spouted town well to do laundry, but some had washing machines. There was a new machine that made the olive harvest faster, used less labor. Machines were isolating people by reducing the need for sociability. Eike, a retired German publisher, despaired. 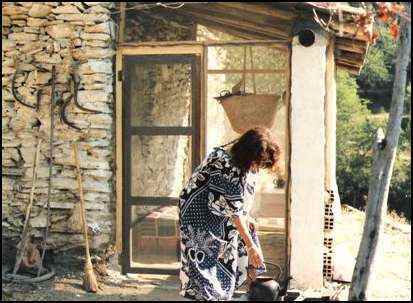 He had built his dream house for maximum privacy, tucked in to the sharp side of the mountain shaded by large olive trees. Now came the Argentineans, fast talking slicksters grazing the bars for local farmers willing to sell their land, to be resold to Dutch, German, English, even American vacationers. They took prospective buyers past Eike’s smallholding, jabbering and gesticulating. Eike sold out, a seeming impossibility in our little universe. He talked of going to New Mexico to join his child and ex-wife. Other Germans came less and less often. The thrill of land ownership was gone. In their place came their friends, and then strangers on vacation. Renters. People with no history, no respect for the land. The camaraderie of the early colonization was fading fast. Even Bill began to see the logic of taking advantage of the new influx, and built three little cabins down by the river, rentals for friendly strangers. Or just — strangers. From our front window we saw girls in pink polyester jogging togs sucking yogurt drinks. Even the older people in their black mourning wool, began demanding gadgets they were seeing on TV. The younger people went to Almeria to work in the invernaderos, the greenhouses where many of them got sick from the poisons. They earned a pittance tending the fat unnatural tomatoes for the greengrocers of northern Europe. They spent their money on cosas tontas. Bill bought a house in Picena, something no-one would have predicted, and rented his finca to an Irish couple who wanted to raise goats. He even got a computer that kept dying because of the town’s erratic electricity supply. Finally he announced he’d found a new guru and was heading for the Orient in search of true enlightenment, making all his marvelous experience in the Alpujarras sound false. It was a blow, but I still wanted to stay on. We’d bought a piece of land known as la gloria – half an acre with orange and lemon , fig, almond, and a couple of olive trees. But we couldn’t make a go of it. Our own need for money , and Art’s restlessness, overcame my idealism. Our flight to England signaled the dissolution of our marriage. I wanted to go back to Picena. Art didn’t. Our charming village home became a vacation site we traveled to for a week at a time, from London. Then it became a rental cottage, then was sold, along with la gloria, to an English pair who had a hobbyist passion for exotic butterflies. Recently I searched for Picena on the internet, for a lark. I saw that our neighbor’s house, a place where we had sat and eaten freshly slaughtered pig meat with Antonio and helped Marisela make morcilla and longaniza sausage, was on the market for about $45,000 – more than 100 times its value 15 years ago. It shocked me. I remembered lying in bed at night, waiting to hear Antonio wander home drunk, and sit on the stoop weeping loudly when Marisela locked him out. It seems to me now that the desire to live in harmony with nature in southern Spain was a chimera – it gleamed always before us, never quite attainable. The expatriates didn’t need to make a true commitment to peasant life, and the peasants were rapidly being converted into eager consumers through the magic of television and the need for money to buy what they saw. I was saddened to think that all the world was turning into a kind of cash-driven theme park, where progress would shine brighter than the real sun and the old people in places like Picena would die quietly in front of their televisions, licking the last of the cherry-flavored yogurt off the spoon while, outside, the cherries on the trees were being devoured by ravenous angry birds.